The current visible satellite pictures showing mainly Partly Cloudy skies across the Findlay and Hancock County area. It is plenty warm and humid this afternoon. Current temperatures are mainly in the middle to upper 80s. Dewpoints currently are in the middle to upper 60s across the area. 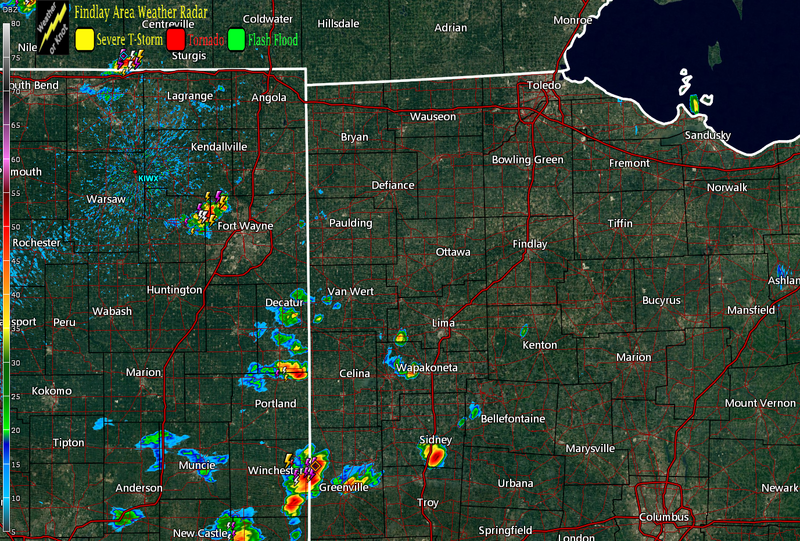 RADAR CHECK: There are some scattered showers and thunderstorms at this hour near the area. However, those have mainly been staying to our south and west. Movement is very slow with these showers and thunderstorms. There is still the possibility of a few popcorn showers and thunderstorms in the local area through the remainder of the afternoon and evening. Just like last evening, these showers and thunderstorms will begin to fade around sunset. One more time, the chances are there for some areas of fog during the overnight. Otherwise, skies should remain generally clear. Overnight low temperatures are forecast to drop back only into the middle and upper 60s by Sunrise Wednesday. START OF HANCOCK COUNTY FAIR: Summer time weather will continue as the Hancock County Fair begins Wednesday. For all of the area, the start of the day will feature plenty of sunshine. By the latter portion of Wednesday Afternoon, scattered showers and thunderstorms are a definite possibility. While widespread severe weather is not in the forecast, the potential will be there for gusty winds, excessive lightning, and heavy rainfall. By Wednesday Evening, the shower and thunderstorm activity will begin to fade. High temperatures Wednesday Afternoon are forecast to top out in the middle to upper 80s. Shower and thunderstorm coverage will be on the decrease Wednesday Evening as we approach sunset. Once again, it is forecast to be plenty warm and humid. Wednesday Night low temperatures are forecast to drop back only into the upper 60s and lower 70s. HEADING TOWARDS LABOR DAY WEEKEND: It will not be feeling like Fall for the start of this Labor Day Weekend. Chances for showers and thunderstorms will continue to decrease as we head towards Thursday and Friday. Temperatures will be remaining warm and humid for the start of the holiday weekend. For Thursday and Friday, temperatures will mainly be in the middle 80s for highs. Low temperatures Thursday Night and Friday Night are forecast to only drop back into the middle and upper 60s. For Saturday and Sunday, the weather looks to be warm, but dry. There is plenty of sunshine in the forecast as well. High temperatures during this period will mainly be in the middle to upper 80s. Low temperatures Friday and Saturday Night are forecast to drop back into the middle 60s. NEXT WEEK: Shower and thunderstorm chances will continue into Labor Day itself. A cold front will be moving through the region as we move into Tuesday of next week. That looks to begin the process of a cooling trend. By Tuesday, high temperatures have the possibility of not reaching above 80 degrees. 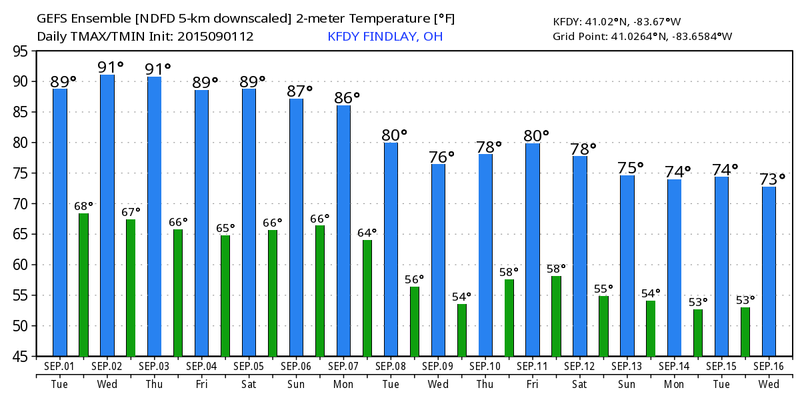 As we mentioned before, it is starting to look like we will be trending towards a cooler weather pattern. Temperatures look to come back below seasonal averages. However, before that, the potential is there for another 90 degree day Wednesday and/or Thursday. Look for the next Forecast Discussion for the Findlay and Hancock County area sometime Wednesday afternoon or evening. Enjoy the rest of your evening!